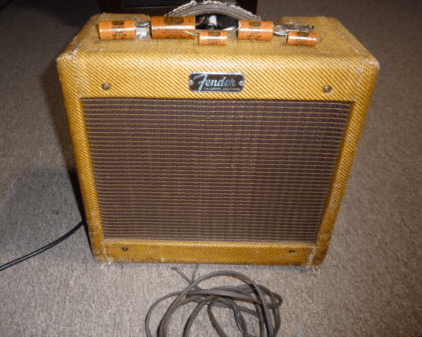 Tweed Fender Champ C 17243 was recently sold for $900. We don’t have a whole lot to go on other than serial number, but we can estimate that it was made in early 1962. The cord and caps have been replaced and the Oxford speaker has been re-coned. The original parts were kept with the amp. I always like seeing when people keep their replaced parts with vintage gear. Stuff just gets old and eventually wears out. I remember reading somewhere that the life of these vintage capacitors is about 20 years. Sometimes you just can’t help having to replace a part. Keeping the original with the amp just somehow makes me feel better about the whole thing!